Some EdTechTalk shows use audio only Shoutcast streams. This can be accessed using almost any media player. EdTechTalk A is the 'main' stream. EdTechTalk B is used to provide a low bitrate option when possible. These instructions are also available as a short 3 minute video screencast/demo. We wish there was an easy 'one click' listening option that would serve all users, but that's not yet possible. To listen to Worldbridges webcasts, click on one of the media player icons above. All of the media players listed below can work, but which one is best and/or easiest for you will depend on how your computer is set up. Please note - You do NOT need to use skype in order to listen to one of our webcasts - you only need to use skype or join the teleconference (see below) if you wish to join the discussion to make comments or ask questions. If you would like to listen with Real Player , simply click on the Real Player Icons above. If you would like to listen with Windows Media Player, click on the appropriate links above. This will not work if you are using a Mozilla based browser like Firefox or Netscape. 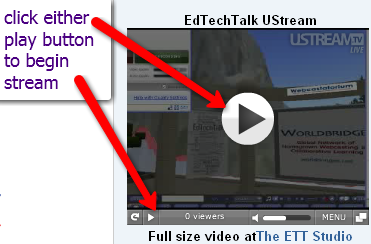 Some EdTechTalk shows use Ustream to stream audio and/or video. 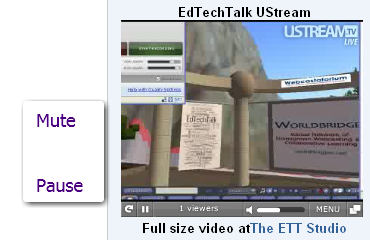 The player can be found on the right side of edtechtalk.com/live. If you want to call in to a show, make sure to pause or mute the UStream before calling in. Otherwise, you'll get an echo. "Hit and miss" is inevitable and not such a bad thing. I don't have a classroom or a set of students right now. I'm in a library. But I have a bunch of kids hanging out in my library all the time, with a self-selected crew hanging in the library office. [ It ain't my office anymore; it's theirs.] What I am confronted with is the essential social component of their interests. We have a connection to the 826 Valencia workshop program here in SF. There are several students = h.s. juniors and seniors - with interest in some of the workshops. But not one of them signed up until I recruited a partner to go with them. Then it was easy to spread the meme. It's all social. Even more so in middle school, at least from the perspective of my 17 years in m.s. before moving to the relative calm of h.s. How do we enable the power of social connection, benign "cliques" and ""groups", in a virtual environment? And then how do we "channel" it? "We wish there was an easy â€˜one clickâ€™ listening option that would serve all users, but thatâ€™s not yet possible." That is a very cool option for adding a 'one click option' for recorded audio. In the listening guide above, however, I was refering to a one click option for listening to the live stream of audio. The audio is not actually streamed live as an mp3, but rather a '.pls' file. We can create work arounds so that it's converted to a pseudo .asx or pseudo .ram, but we're still looking forward to the day when there is a one click option for live streaming.